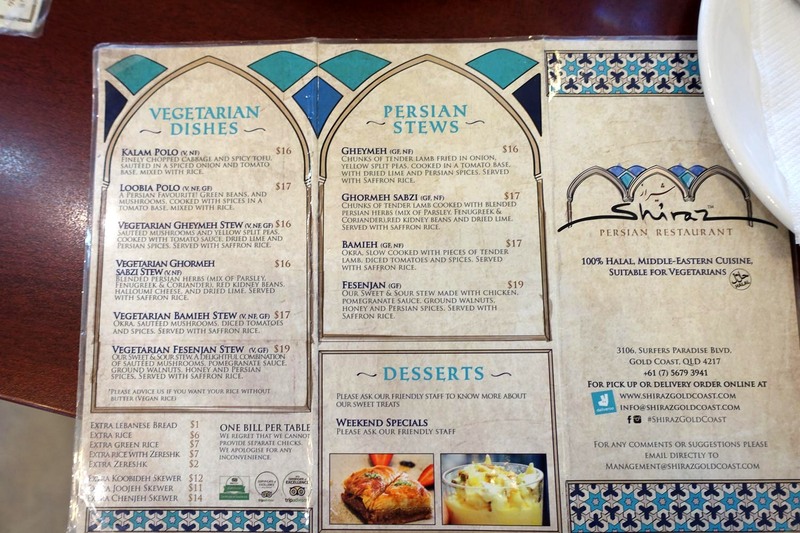 A Persian restaurant on the Gold Coast, right in the middle of Surfers Paradise. 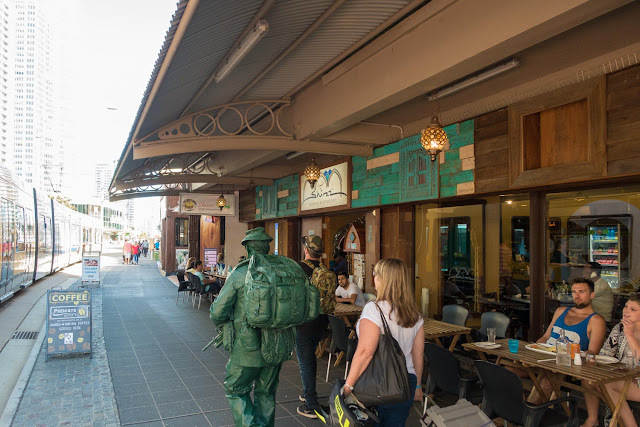 We head up to the Gold Coast a few times a year to visit the folks, a good time away from the heat is the Anzac Day long weekend. Green soldier explained. 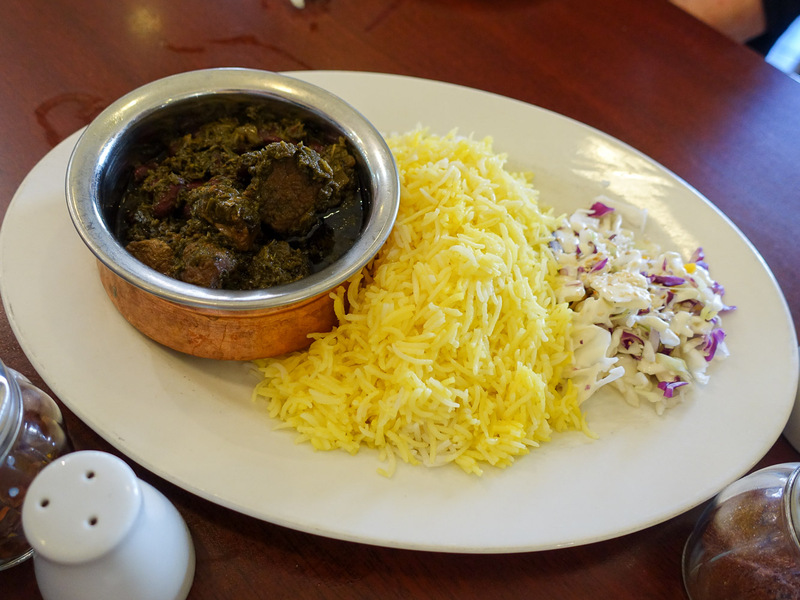 When they are down in Sydney we've taken them out to Merrylands for some Afghani which is a hit all round, what's not to love when there's tender lamb and fluffy rice? So finding something that suits all our tastes comes easy when we hit on Shiraz Persian right along the tramway along Surfers Paradise Boulevard. 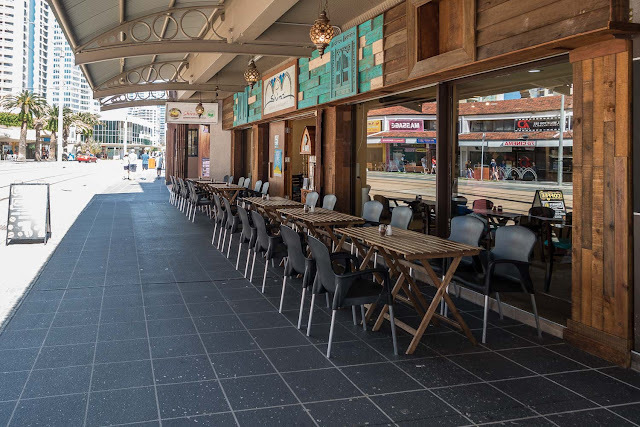 It's a rare GC find that offers something beyond a Hogs Breath Cafe or fast food, also one of the only places in Surfers that is halal. We all feel in a very lamby mood, so we get a few different dishes to try out. Gheymeh is one of our favourite Persian stews, the dried lime and tomato sauce is such a fantastic combo. The small pieces of lamb are soft and tender and the serve of buttered rice is as usual, fluffy and generous in size. Shakers of sumac let you add some extra citrusy spice to your meal. A platter of mixed kebabs arrives as the centrepiece. 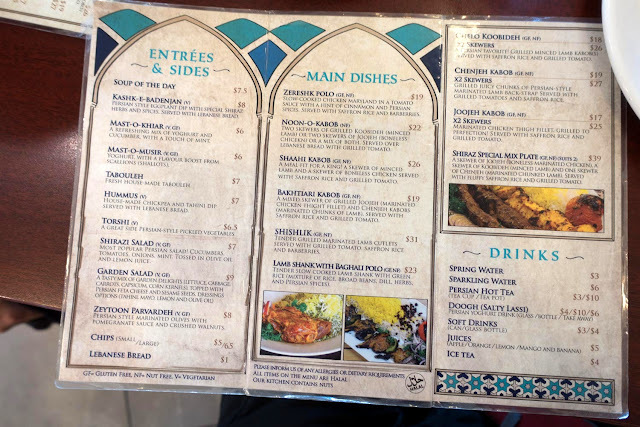 Ordering this means everyone gets to try a few different pieces of meat from the chenjeh (tender lamb backstrap) to the koobideh (minced lamb wrapped on a skewer) and some joojeh (marinated chicken pieces). More fluffy rice and char grilled tomatoes. 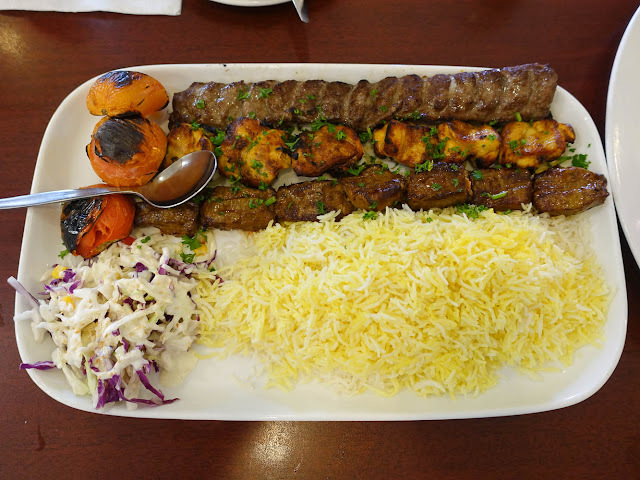 A big platter of meat for $39. 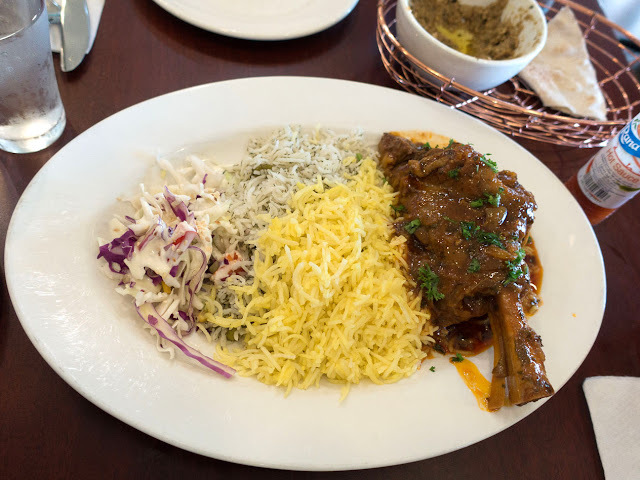 Our last piece of lamb is a stewed shank with baghali polo, a mix of rice and broad beans that makes the rice a little green from the added dill and beans. Each dish also had a spoonful or so of shredded cabbage salad, kind of a Persian coleslaw and flat bread was served to help scoop everything up with. 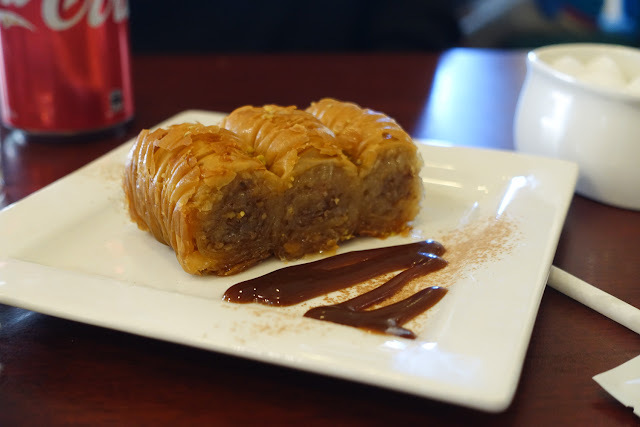 The sweet tooths are kept appeased with some baklava, there's a changing range of selections at the front counter.